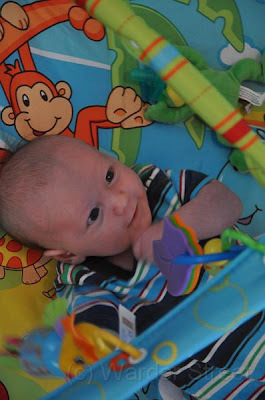 This week we started William on a new bedtime routine with the goal of teaching him how to sleep through the night. Don't worry-we aren't optimistic. 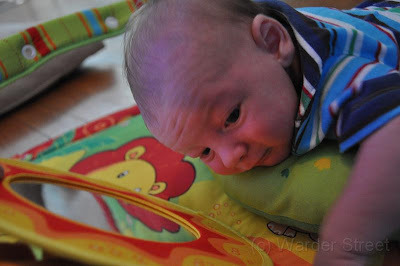 At least this new routine will teach him to expect bedtime and later on hopefully help us when we put him to bed. Honestly he's not a bad sleeper now. As long as he's swaddled he'll just eat and go back to sleep. He really only wakes up once or twice a night anyway. But the new routine is bath around 9ish, bottle with Dad, a bedtime story and bed. Last night he was in bed by 10:30pm and slept until 3:15. He got up, ate and went back to sleep until 7! 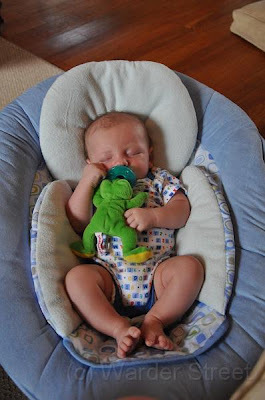 One of William's new favorite things is his Wubanub, nicknamed Wubby. 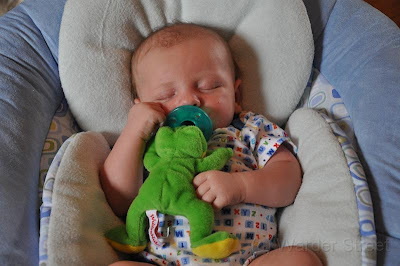 A Wubanub is a small stuffed animal attached to a Soothie Pacifier. 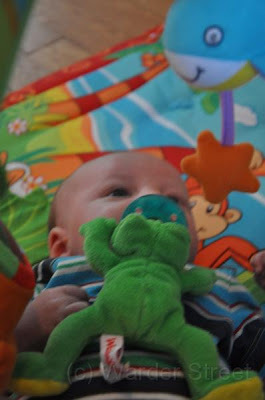 It's meant to be easier for a baby to put back in his mouth, but William isn't quite there yet. 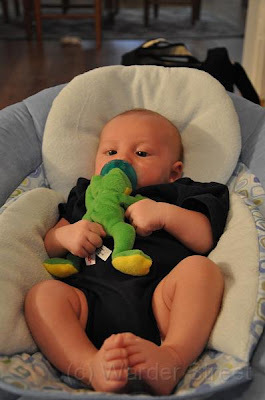 However, he does love to snuggle with it. So adorable. Today William and I met some friends from my Pregnancy Group. Amazingly all 10 of us had boys between February and July. Crazy! We are making this Tuesday coffee a weekly event. Not much else going on right now. Stay tuned for video of William coming soon! 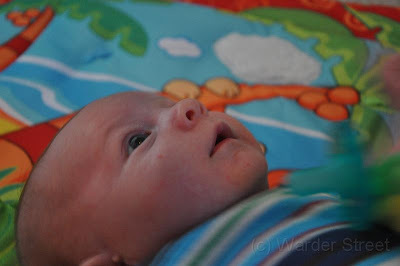 Photos below of William being cute on his play mat! 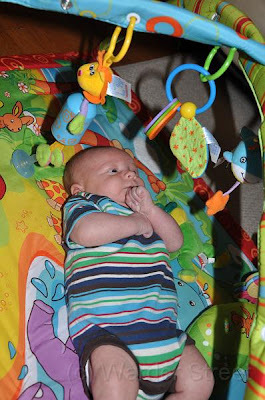 Here he is contemplating the toys. Despite my best attempts this is the closest I've come to getting a picture of William's smile.